Add olive oil to a large skillet over medium high heat and lightly brown flat breads about a minute on each side. 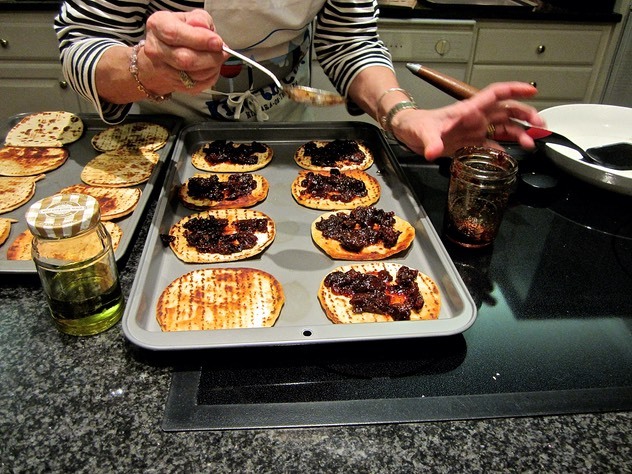 Place flat breads on a baking sheet and spread each one with enough fig preserves to cover. Bake for 6 to 8 minutes to melt cheese. Add figs to 4-quart pot or Dutch oven. Add water and bring to boil. Remove from heat and let stand until figs are plumped, about 15 minutes. With a slotted spoon, remove figs; reserve liquid. Let cool briefly. Add figs, sugar, ginger, and lemon juice to reserved liquid and heat to boil. Reduce heat to medium and simmer for 20 to 30 minutes, until thickened. Stir in rum; heat to boil. Boil 1 minute. Ladle into sterilized pint or 1/2-pint jars, leaving 1/4-inch headspace. Cover and seal jars according to instructions.